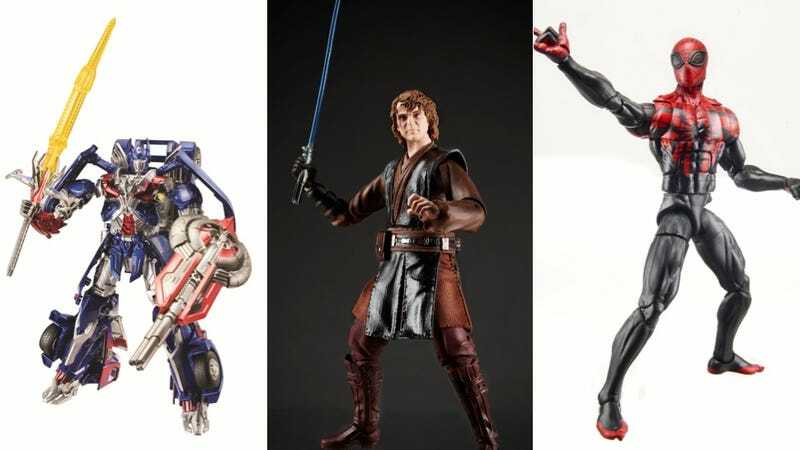 Hasbro debuted a bunch of toys at the New York Comic-con last night, and you're going to want to check them out. Get the first look at the redesigned Optimus Prime from Transformers: Age of Extinction, the debut of the Dungeons & Dragons Kre-O line, upcoming Marvel movie figures and more! I don't know Michael Bay made the Transformers even more over-designed, but he appears to have done it. And what's the deal with his massive sword and shield? This is the Electronic Spider-Sense Mask; the discs have a reflective material on them that glows, but which can only be seen by the mask. I find this oddly amazing. The figures are great, but I'm pretty disappointed with the sets themselves. I was hoping for more dungeons than tiny castles.